How do I contact BPI/BPI Family Savings Bank regarding any inquiry or request for my Housing or Auto Loan? Call, e-mail or visit us at the ff. offices anytime. 1. What are the different ways I can pay for my Housing or Auto Loan? 2. How can I view my loan details in EOL or BPI Mobile App? To be able to view your loan details online, first enroll your BPI or BPI Family Savings Bank deposit account by visiting http://www.bpiexpressonline.com and signing up on the website, and/or downloading the BPI Mobile App on your iOS or Android device. If you already have an existing BPI Express Online account, you should automatically be able to view your loan account details online and on the BPI Mobile App. * If no loan account appears on your EOL page or on the BPI Mobile App, please contact 89-100 (enter option for EOL) to request for linking of your loan to your EOL account. Please note that once loan has been fully paid and closed, details will no longer appear in EOL/BPI Mobile. 3. How can I apply/arrange my payment thru Automatic Debit Arrangement (ADA)? * If you already have an account for enrollment, please contact us at the above contact info to enroll your account in ADA. 4. I've already enrolled in Automatic Debit Arrangement (ADA), what happens next? Your monthly installment and/or any amount due will be automatically deducted from your designated settlement account. This may include any fees and charges setup to your loan account such as insurance premium, late payment charges, etc. You may view the amount to be debited on your next due date anytime via your EOL account. * Please ensure that your settlement account is funded on or before the due date to avoid the account turning past due. Make sure to include any insurance premiums that will be due for payment. 5. My payments aren't being debited from my Automatic Debit Arrangement (ADA) account on my due date. What should I do? If your due date falls on a weekend or bank holiday, your payment will be debited automatically on the next banking day. If it still is not debited, check if your ADA account is properly funded for the whole amortization amount, including any fees and charges such as insurance premium, late payment charges, etc. If your account is funded but your payments aren't being debited, please contact us immediately to resolve any concerns and avoid incurring further late payment charges. 6. How do I change my Automatic Debit Arrangement (ADA) settlement account? Please send us a filled out ADA form and a copy of your valid ID. Request may be sent to our addresses above, via e-mail, or at any BPI or BFSB branch. 7. How do I pay for my loan at BPI or BFSB branches? Tap BEA to start transaction. Choose "Bills Payment" as your selected transaction and tap next. Select the correct merchant where payment will be made. For auto loans, tap "BFB Auto Loan". For housing loans, tap "BFB Housing Loan". Enter your complete 14-digit loan account number (0000000XXXXXXX) on the next screen. This will be your reference number. Select your mode of payment, either in cash, check, or both cash and check. A new prompt to check transaction details (type of transaction, reference number, cash amount and check amount) will be shown before finalizing payment. Once details are confirmed correct, tap next. Get your queue number slip and wait for your number to be called. 8. What if I pay by means of a check? 9. How do I avoid late payment charges? Payments should be made on or before the due date to avoid late payment charges. For ADA accounts, the funds should be enough to cover the total amount due including any fees and charges that may be setup to your loan account. In case your due date falls on a weekend/non-working day, debiting will be the next banking day. 10. I have been receiving text messages and notices regarding my account, what number should I call? We send periodic system-generated reminders and notices to you via SMS and mail. If you do not know why you are receiving these notices, please contact us through any of the above channels so we can assist you on this. 11. Why are my payments not being entirely deducted from the principal balance? Any payments made is first applied to satisfy any late payment charges incurred, then insurance fees, interest, and lastly principal. If you are not sure about the application of your payments, you may contact us anytime. We can also issue you an amortization schedule or a history of application of payment (with corresponding fee). 12. I would like to pay my loan in full. How do I go about it? Please contact us or request through BPILoans.com a Statement of Account to Fully Pay (SOAFP) as of the payment date. Please note that SOAFP cannot be issued for your actual due date and cannot fall on a non-banking day. Fill out the Authorization to Debit form. Send completed form to our addresses above, via e-mail, or at any BPI or BFSB branch at least 3 banking days prior to debit date. 13. I have made excess payments for my loan and would like to request for a refund. If your account is already fully paid and you have received a notice from the Bank, please fill it out and send it to us ASAP so we can process your refund request. If you have not received a notice, please fill out the Refund Form and send it to our addresses above, via e-mail, or at any BPI or BFSB branch, so we can validate and refund any excess payment. 14. Can I make a lumpsum/balloon/partial payment for my loan to be deducted directly from principal? You may make the payment over-the-counter (see above for payment instructions) or fill out the Partial Payment Form and send this to our addresses above, via e-mail, or at any BPI or BFSB branch at least 3 banking days before date of payment. Processing of the application of payment to principal takes 7-10 banking days. While this is being processed, the outstanding balance viewable in your EOL account may not be updated until after the processing has been completed. 1. My comprehensive motor vehicle Insurance policy (for auto loans) or fire, earthquake and acts of nature insurance policy (for housing loans) will expire next month, what should I do? Once your insurance policy has expired, BPI Family Savings Bank will automatically procure a policy for you* from BPI/MS Insurance. BPI/MS will send you an insurance policy and quotation within one month from the expiry of your policy. * Once your outstanding loan balance falls below Php 200,000.00 (for auto loans) and Php 50,000.00 (for housing loans), insurance coverage will no longer be required by the Bank, and will be your sole discretion. Thus the Bank will no longer automatically renew your policy. 2. I want to avail of insurance coverage for my vehicle/property from another insurance company, what should I do? Please be sure to submit these to us on or before the expiry date of your current policy. Should you submit your policy after the expiry date, you may be required to pay cancellation charges for the BPI/MS policy that the Bank has procured for you. You are required to renew your insurance policy with BPI/MS for the rest of the loan term, under the Automatic Renewal Agreement that you signed during loan booking. If you still wish to procure your insurance policy from another insurance company, you are obliged to pay the full premium for the availed first year insurance policy. Please contact us to set up this arrangement at least two months before the expiry of your current policy. 3. How do I know if my insurance policy is acceptable and if my insurance company is accredited by the Bank? You may contact us at any time to verify this. If you are not sure if your insurance company is accredited by the Bank, please already include the letter of accommodation upon submission of policy to the Bank. 4. I have my own procured insurance policy but I wasn't able to submit it on time. Can I still submit my own policy? You may contact BPI/MS to verify if they have already issued the policy for your account, and you may request for cancellation of the policy, subject to approval, and payment of cancellation charges. 5. What will happen if I fail to submit on time? As indicated in the Promissory Note with Chattel Mortgage and/or the Mortgage Loan Agreement signed during loan booking, in case of non-submission before the expiry date of your last policy, the bank will procure a policy on your behalf, and you will be required to pay for the premium. 6. I don't want to procure any insurance coverage for my collateral. Can I have it cancelled? No, it cannot be cancelled. One of the requirements for your BPI Family Savings Bank Housing or Auto Loan is comprehensive insurance coverage for your collateral property or vehicle. As long as the collateral is still mortgaged with the Bank, it must remain insured at all times. This is also indicated in the Promissory Note with Chattel Mortgage and/or the Mortgage Loan Agreement signed during loan booking. 1. Upon full payment, when and where can I get my collateral documents? Standard releasing time for collateral documents is 15 banking days from date of full payment. However please make sure to call us at our contact numbers prior to pick up to confirm that documents are available for release. Documents may be claimed at the respective offices indicated above depending on where the account was booked. * For Auto Loans, registered owner/s may request for original collateral documents to be delivered to their preferred branch. To request, please fill out and sign the Collateral Document Delivery Request Form and send to our addresses above, via e-mail, or at any BPI or BFSB branch together with your valid ID/s. 2. Who can claim the collateral documents of the fully paid loan? ALL of the registered owners of the collateral whose name/s appear on the collateral document must be present upon claiming the collateral documents. In the absence of any one of the registered owners, an authorized representative may pick up the documents on their behalf, they must present a Special Power of Attorney authorizing them to pick up the documents on their behalf, or an original signed authorization letter, and a copy of the absent owner's ID. This also applies if the authorized representative is a co-borrower or a spouse of the owner. 3. What are the requirements in claiming the collateral documents? The borrower should present a valid ID. If there is more than one registered owner on the collateral document, each should present a valid ID. In cases where all borrowers are not physically present - valid ID of each borrower, valid ID of the representative and original authorization letter or SPA signed by all borrowers. In cases where borrowers are out of the country - SPA with the seal of the Philippine Consular Office, copy of valid ID of each borrower and valid ID of representative. 4. If one of the borrowers/spouses is already deceased, what are the requirements in claiming the collateral documents? 5. I was out of the country for two (2) years and I was not able to get the collateral documents of my fully paid loan, how do I go about it? You may claim your documents any time during office hours at our office addresses indicated above. Please ensure you have the complete requirements stated above upon pick-up. A safekeeping fee may be charged upon pick-up. 1. How do I update my contact information (mailing address, e-mail address, telephone number, mobile number, etc.)? 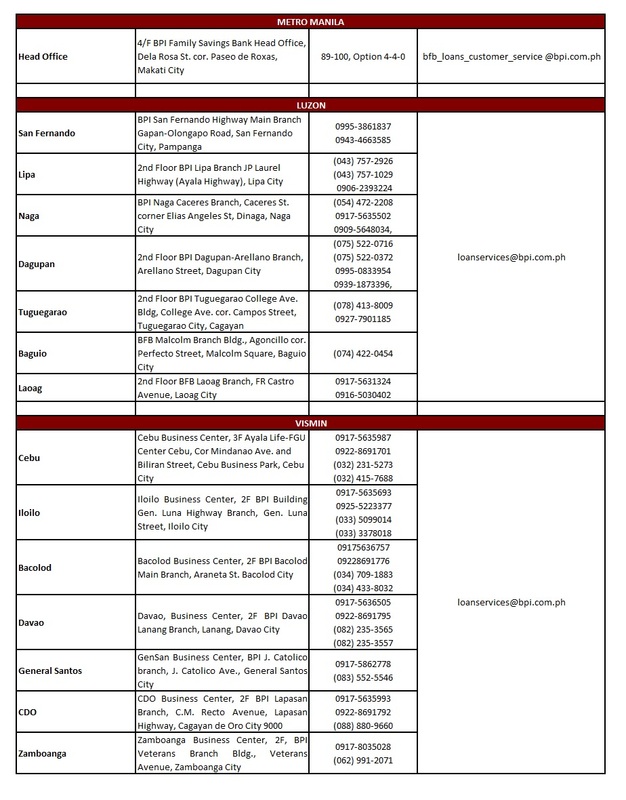 Please send to us at our addresses above, via e-mail, or at any BPI or BFSB branch the filled out and signed Contact Info Update Form, and any proof of new address or contact number such as billing statement, etc. Please wait for our confirmation via text or e-mail that your contact information has been updated. 2. If I have other questions regarding my existing loan, where can I reach you? You may reach us any time through our contact channels as indicated above. NOTE: The above information is updated as of July 2018, and may be changed without prior notice.